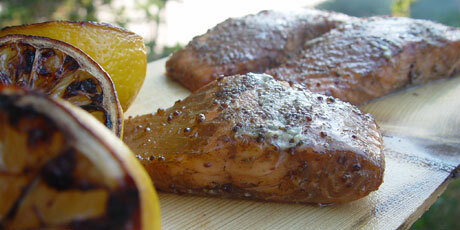 This sweet and smokey salmon is perfect for a summer dinner. 1. Whisk together the maple syrup and mustard and pour into a zipper bag. Add the salmon filets and seal the bag. Mix it around using your hands to make sure the fish is completely covered in the marinade. Place in refrigerator for a few hours or even overnight. 2. Heat an outdoor grill to high, or build a campfire, and after it has died down a bit carry on. When you are ready to cook, pull the planks from the water and toast one side of them over the open flame for a few moments. Dry the surface and lightly char it then place the salmon on it. Place on a rack over the fire, or onto the preheated barbeque. Cook until the salmon is firm to the touch, and barely cooked through in the centre, approximately 8 to 10 minutes. 3. Meanwhile place lemons, cut side down, onto the rack and grill until warm and juicy.